For many gamers, the Origins Game Fair feels just the right size. Unlike Winter Fantasy, the convention offers diversions beyond non-stop Dungeons & Dragons and Pathfinder. Unlike Gen Con, you don’t face a city and a convention center crowded to the limit. In 2015, Gen Con brought 61,423 unique visitors to Indianapolis. Origins 2016 brought 15,479 unique visitors to the similarly-sized city of Columbus. At Origins, you can reserve a hotel room without winning a lottery and you can pay for it without winning a lottery. Origins features reasonably priced options in a connected food court. Gamers can also walk to downtown restaurants or cross the street to the North Market. This pavilion features vendors selling Mexican, Indian, Polish, barbecue, Italian, sushi, and many other types of food. Origins started in 1975 as a convention sponsored by wargaming-giant Avalon Hill in its home town of Baltimore. In tribute to Avalon Hill and its town’s role in the birth of hobby gaming, the convention took the name Origins. In Origins’ early years, it became the convention where the board- and miniature-gaming enthusiasts could find refuge from the the role-playing gamers who infested their hobby and who took over Gen Con. In 1988, when Origins and Gen Con combined into a single event for a year, those old wargamers grumbled. Compared to Gen Con, Origins still tilts more toward board and miniature games. It shows fewer signs of fan culture like anime screenings, celebrity guests, and costumes. This year, Wizards of the Coast made a strategic move to avoid Gen Con and feature Origins. Members of D&D team, including Mike Mearls, Chris Perkins, Chris Lindsay, and Trevor Kidd visited the con, while none will reach Gen Con. 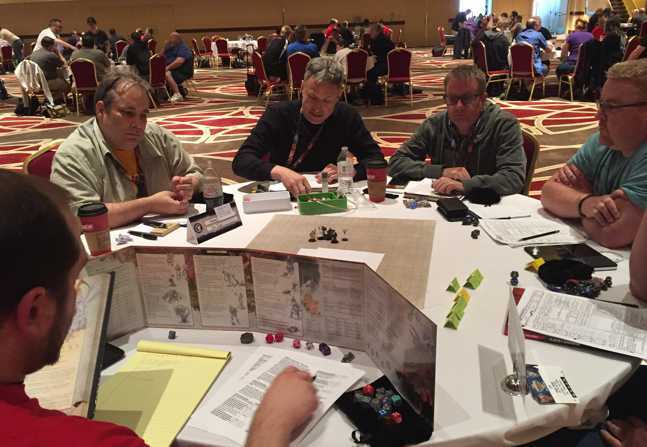 As with Winter Fantasy and Gen Con, the folks at Baldman Games operated D&D organized play. The con launched a new program where conventions can commission Adventurers League adventures for their events. The organizers gain exclusive access to their content for six months before releasing it to the world at the Dungeon Masters Guild. Adventures in this new program will center on the Forgotten Realms Moonsea region. The D&D experience pairs tables of six players with the same, top-rated DM for all four adventures. My table’s judge, Krishna Simonse, did an outstanding job accommodating our taste for combat challenges harder than the adventure’s strong level and our love of grids. In addition to the exclusive content, the convention premiered the final, season 4 Curse of Strahd adventures and the kickoff for the season 5 Storm King’s Thunder story. The new Open’s all-star team of authors, Teos Abadia, Shawn Merwin, and Sean Molley captured all the challenge that made the old event such a blast. In eight hours, the new Open aimed to combine the fun and community of a battle interactive, with a measure of the competition of the old tournaments. My D&D Open team, with me in black, listening intently to the DM’s description of our next challenge. Most of the event pitted players against an old-school funhouse adventure set in the megadungeon of Undermountain. Here the challenges proved as fun as any tournament I’ve played. I loved how so many locations wrapped combat encounters with puzzles to be solved. In a maze, PCs raced to gather clues while fleeing minotaurs and mind flayers. In castle ruins, PCs needed to find a way to turn catapults against a Death Tyrant. Best of all, the authors made the new Open hard—none of the namby-pamby, say-yes, everybody-is-a-star D&D in fashion now. Characters died. Our table saw one character Plane Shifted to certain doom and a second slain by a death ray. Save or die! Gary would be pleased. For a climax, the tables joined forces against a diabolic machine constructed by Halaster, the mad architect of Undermountain. Sean Molley showed astonishing ability to speak loudly enough to be heard from the far side of the ballroom while still taunting us in the Doofenshmirtz-like voice of Halaster. I still wish for a more rigorous tournament with pregenerated characters, multiple rounds, and elite dungeon masters striving for consistent rulings and style. The D&D team sees that style of tournament as history. For most players, the new Open probably offers more fun. For an old grump like me, the Open still ranked as my best game of the year. Wizards is already hatching plans for next year’s Open. Based on the event’s success, I suspect they will offer this year’s adventure to other conventions, but that remains undecided. In all, Origins 2016 ran twice as many Adventurers League tables as in 2015. The Origins Game Fair returns to Columbus on June 14-18th of 2017. See you there. This entry was posted in Conventions and tagged Adventurers League, Avalon Hill, Baldman Games, Battle Interactive, Chris Lindsay, Chris Perkins, D&D Championship, Dave Christ, Forgotten Realms, Gary Gygax, GEN CON, Mike Mearls, Origins convention, Sean Molley, Shawn Merwin, Teos Abadia, Trevor Kidd, Winter Fantasy. Bookmark the permalink. Do you happen to know if that Sean Molley came from San Diego? David, I’m so glad you liked the Open! I was dying to swing by your table more often and ask. This was a hard event to get right, but fortunately we had a really clear imperative from Wizards: make it a competition, but fun for everyone. It was an absolute joy to create the encounters. Thanks. Didn’t think it might have been the same Sean. The one locally would have been really old school. We used to have one guy name of Bushman(IIRC) who had played with Gygax and Dave Hargrave(Of Arduin). Thank for the report. I still wonder about the elephant in the room. Why has Wizards of the Coast basically abandoned the worlds largest convention, and the one D&D made famous? I assume this decision has more to do with Hasbro than Wizards, but I don’t understand this new focus on Origins. You point out some good reasons as to why a player might prefer the Ohio convention to Gencon, but thee major RPG company in the world not being officially represented there is mystifying from a marketing stand point. 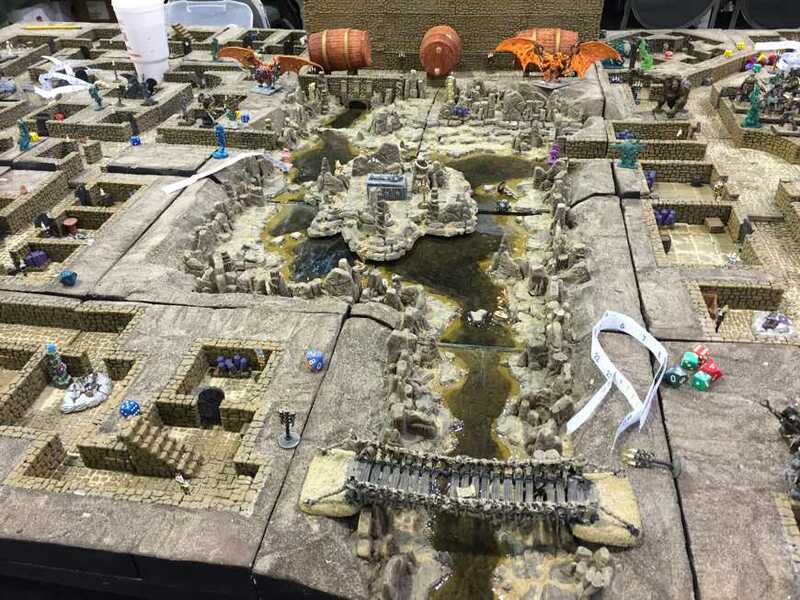 Has Hasbro deemed Gencon an unworthy expense, or did Wizards retreat out of embarrassment after being outclassed by younger cousin Paizo so many years in a row? It is good to hear positive reports on Baldman’s organized play. Reports I heard from Gencon last year were largely negative. 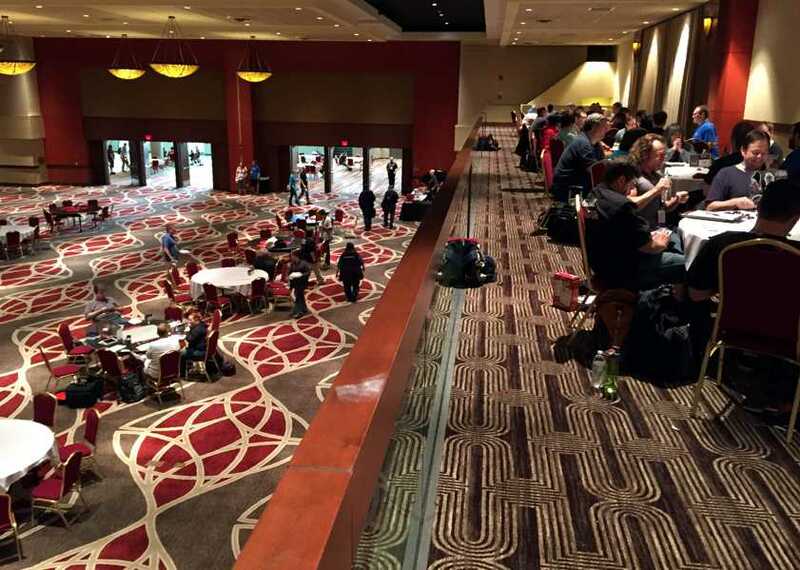 The large carpeted room they have looks like a big improvement over the shared concrete shell they booked for Gencon 2015. From what has been said publicly, Gen Con is super-expensive and it can be hard to work with them. WotC can take the money from that one show and redirect it to several conventions, including an even bigger Origins. (I would say that the show at Origins this year had far better support than last year’s Gen Con). What I find most convincing isn’t what WotC says. It is that when WotC announced the change, every small and medium RPG publisher voiced complete understanding. They too find it really hard to be at Gen Con. I’ve since spoken to a couple of other small publishers who are pulling back or completely moving away from Gen Con. For others, it is seen as a necessary task (and, don’t get me wrong, they love Gen Con but wish it weren’t so hard/expensive). On the Hasbro vs WotC… I wouldn’t make a big deal of this. TSR had years when it badly needed oversight. WotC generally benefits from the oversight Hasbro provides, and certainly from the deep pockets that can be provided when necessary. WotC can fund amazing things, which it could not do without Hasbro (or the D&D team without the rest of WotC). Overall this is a good thing. Sure, sometimes Hasbro or WotC might place big limits, but we have to remember the larger context: it is ridiculously hard for RPGs to make money. Yet, they are businesses. We have to expect (and welcome) that a company wants to continually tweak things to find a way to make that happen. Overall, there isn’t likely a Hasbro issue here. It is really likely that it is what it seems to be: Gen Con is a tough spend. Hard to work with and expensive. So, this is another way to still provide great support (arguably, better support) and spend less time organizing. So far, this seems to be true. WotC seems to be providing better support overall and launching and accomplishing more things (such as the Open and other things we shall soon see). On the Paizo side… WotC doesn’t look at it as competition. WotC’s competition is entertainment – video games, movies, large things that take gamers away from tabletop. A Paizo vs WotC battle isn’t worth even worrying about when you have the larger issue and so many people outside the hobby who could potentially come into it. 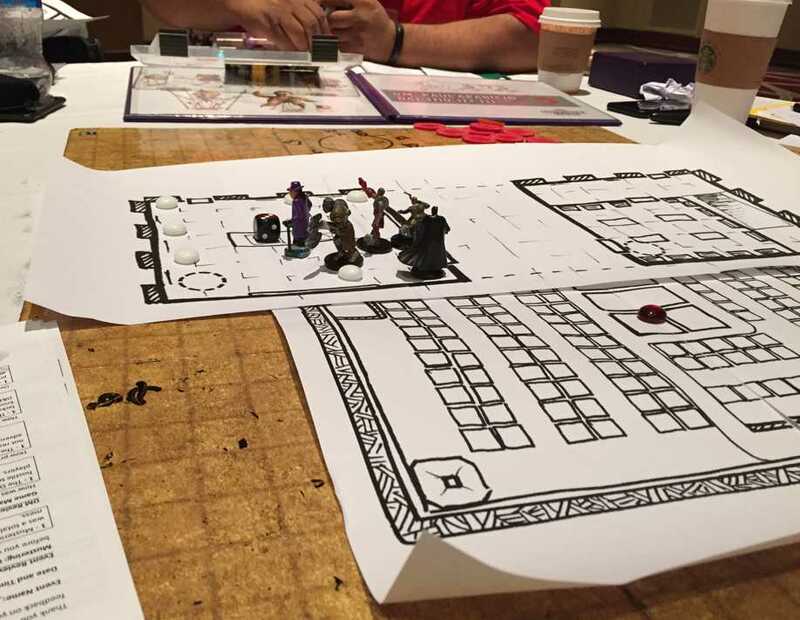 WotC gave up the Gen Con Sagamore ballroom that Paizo now uses, and both parties seem to like the current situation. It is an insanely expensive room. Paizo is willing to pay that fee, but I would guess that this is why they then have a smaller presence at other cons. Different approaches, both fine. But it isn’t about anyone showing up anyone, because that isn’t the game. Both companies need to look outside the hobby and draw people in, because that’s the only way to actually make good money. Realistically, they also need to diversify out of the trainwreck that is the financial state of our hobby (it doesn’t make money). That’s why we see WotC focusing on licensing and why Paizo tried to launch an MMO – any real money is going to have to come from someplace else. As gamers, we should cheer on both companies’ efforts. WotC’s 5th edition has been amazing at drawing in new players. Paizo has been a fantastic force at retaining older players and drawing in new ones. Both have grown their presence each year at Gen Con (maybe this year WotC will shrink at Gen Con after doubling at Origins). Seeing both of them grow across the year, whatever their approach, is cause for celebration. Alphastream — Know this is a year old post, but really enjoyed your take on the business side of this hobby. Thanks. My pleasure! It is really fascinating to try to figure out how this industry we love works!